Fiona Maye is a leading High Court judge who presides over cases in the family court. She is renowned for her fierce intelligence, exactitude, and sensitivity. But her professional success belies private sorrow and domestic strife. There is the lingering regret of her childlessness, and now her marriage of thirty years is in crisis. IAN McEWAN is the bestselling author of fifteen books, including the novels Sweet Tooth; Solar, winner of the Bollinger Everyman Wodehouse Prize; On Chesil Beach; Saturday; Atonement, winner of the National Book Critics Circle Award and the W. H. Smith Literary Award; The Comfort of Strangers and Black Dogs, both short-listed for the Booker Prize; Amsterdam, winner of the Booker Prize; and The Child in Time, winner of the Whitbread Award; as well as the story collections First Love, Last Rites, winner of the Somerset Maugham Award, and In Between the Sheets. "McEwan presents a ferociously intelligent and competent woman struggling to rule on a complex legal matter while feeling humiliated and betrayed by her husband ... a notable volume from one of the finest writers alive." "A short, concise, strong novel in which a judge's ruling decides the fate of a teenage boy in ways she never intended or imagined ... it's a book that begins with the briskness of a legal brief written by a brilliant mind, and concludes with a gracefulness found in the work of few other writers." "A quietly exhilarating book ... The Children Act chronicles the recalibration of a 30-year marriage after it has fallen out of balance." "Haunting ... a brief but substantial addition to the author’s oeuvre." "[The Children Act’s] sense of life-and-death urgency never wavers ... you would have to go back to Saturday or Atonement to find scenes of equivalent intensity and emotional investment." "Smart and elegant ... a grown-up novel that reminds us just how messy life can be and how the justice system ... doesn't always deliver justice." "The Children Act manages to be highly subtle and page-turningly dramatic at once ... Only a master could manage, in barely over 200 pages, to engage so many ideas, leaving nothing neatly answered." "Heartbreaking and profound, it skillfully juxtaposes the dilemmas of ordinary life and tabloid-ready controversy." 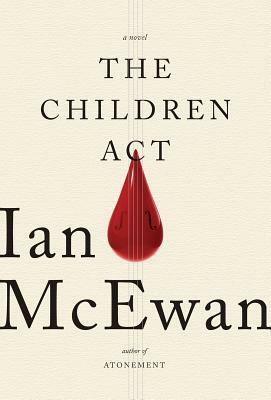 "McEwan crafts a taut morality tale in crystalline sentences." "As in Atonement, what doesn’t happen has the power to destroy; as in Amsterdam, McEwan probes the dread beneath civilized society. In spare prose, he examines cases, people, and situations, to reveal anger, sorrow, shame, impulse, and yearning. He rejects religious dogma that lacks compassion, but scrutinizes secular morality as well ... Few will deny McEwan his place among the best of Britain’s living novelists." "McEwan, always a smart, engaging writer, here takes more than one familiar situation and creates at every turn something new and emotionally rewarding in a way he hasn’t done so well since On Chesil Beach." "Irrefutably creative ... With his trademark style, which is a tranquil mix of exacting word choice and easily flowing sentences, McEwan once again observes with depth and wisdom the universal truth in the uncommon situation."